Airline Transport Professionals (ATP) today announced the delivery of a new Frasca CRJ-200 Flight Training Device (FTD) to its Phoenix, AZ campus. ATP’s CRJ-200 FTD is more than just a cockpit procedures trainer. 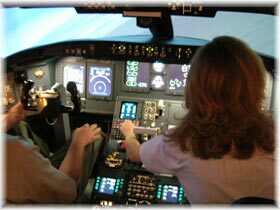 The training device fully implements all systems on the CRJ-200 aircraft. Combined with a visual projection system, the training device offers maximum realism. The FTD will be utilized to introduce students in the Regional Jet Standards Certification program to Swept Wing Jet Aircraft flying, systems and navigation in order to prepare pilots for fast paced airline training. ATP has an additional two CRJ-200 FTDs at its Jacksonville Beach, FL training center and two CRJ-200 FTDs at its Arlington, TX location.